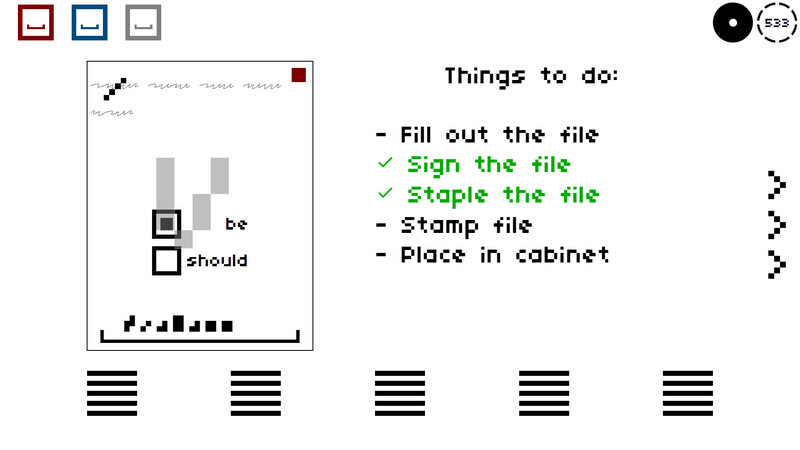 Just minutes ago, a game called Take Care of the Paperwork launched on Steam; it’s a paper filing simulator and has a delightful $1.79 price tag attached to it. I got the honor to talk with qberty, the developer behind this fun office simulation title. Welcome qberty. So your game has been released on Steam, how do you feel? I’d say I feel a bit nervous. The game is designed to be difficult by nature, so I can’t see too many people having a fun time. If you had to describe your game in one sentence, what would it be? TCOTP is a paper pushing game designed to push you to your limits of how much filing a single person can really do. What was your greatest challenge during the development of Take Care of the Paperwork? I think the biggest challenge was constantly testing and retooling the levels so that they would scale well as the player gets to a higher level. What inspired you to make Take Care of the Paperwork? This is a hard question. I originally had the idea after I spent an entire day filing a big database of profile entries and figured it was not unlike how secretaries have to file paperwork in their daily jobs. I wanted to see how far I could push a simple concept. And finally, will you be updating the game post-launch? I will definitely be updating this game after it launching as I can tell people will go way beyond the pain and suffering of what I initially thought they could handle when it comes to filing papers. Take Care of the Paperwork is out now on Steam with a 10% discount.